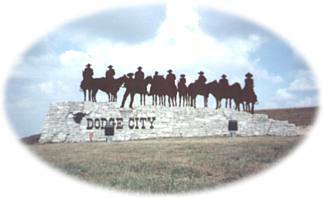 Dodge City's history began with the establishment of Fort Dodge in 1865. The fort was an active military post until 1882. Its purpose was to protect wagon rains on the Santa Fe Trail and to serve as a supply base for troops involved in Indian wars to the south. Fort Dodge has been a Kansas State Soldier's Home since 1889. Dodge City was founded in 1872 just west of the military reservation. It quickly became a trade center fro buffalo hunters and travelers. The Atchison, Topeka & Santa Fe Railroad reached Dodge City in September of 1872 and the town's continued existence was assured. For the first few years there was no local law enforcement and the military had no jurisdiction over the town, so lawlessness reigned. Arguments between buffalo hunters, railroad workers, drifters and soldiers quickly led to shootings and created a need for a local burial ground -- Boot Hill Cemetery. The buffalo were gone by 1876, but a new source of revenue for Dodge City soon came in the form of Longhorn cattle from Texas. During the next ten years, over five million head were driven up the western branch of the Chisholm Trail and the Western Trail to Dodge City. Cowboys from the cattle drives, many of whom were former Confederate soldiers, and the soldiers from Fort Dodge were kept away from each other and from the respectable people of Dodge City by such peace officers as Bat Masterson, Wyatt Earp, Bill Tilghman, Charlie Basset and others. Today the beef cattle industry is still vitally important to the town's economy. In 1874 a hardy winter wheat called "Turkey Red" was introduced into Kansas which quickly turned most of the state from grazing land to crop land. As the town grew, the "wild west" slowly disappeared. Boot Hill was gone by 1880, in 1882 the fort was closed and in 1885 the cattle drives stopped. An illustrious period of history was over but the legend lives on in Dodge City's historic preservation of its romantic and internationally famous past. This demanding private course is excellent for all skill levels of golfer. The small greens are fast. The course's signature hole is #17, a 148-yard, par 3, requiring a tee shot to a green framed by large trees. Donald Sechrest designed the back nine, which was added in 1982. Mariah Hills has about everything a golfer needs from a bright and spacious clubhouse to a professionally manicured course. Rolling bluegrass fairways and bent grass greens set against the native beauty of the high plains provide a fun yet challenging experience. 400 W. Wyatt Earp Blvd.